The Stable of Svenstorp is managed by Leif Jakobsson and Giesela Rönneling. 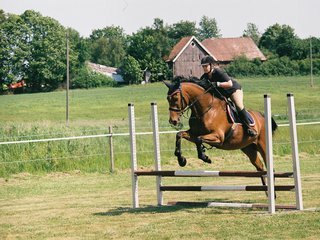 Our goal is to breed healthy, well trained Swedish Warmblood for Show jumping, Three-day event and Dressage. The photo above to the left shows our horses, in an early summer morning. The photo in the middle shows Sherry with her foal Attilla. Sherry has competed in Three-day event with placing in S class and she had breeding classification AB. On the photo at the right you can see High Zurprise jumping. You are very welcome to contact us if you are looking for a nice young horse for jumping, dressage or eventing. High Spirits is breed from very famous racehorses. 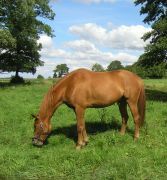 She has competed as a race horse between year 1999 and 2002 she raced 17 times and has won about 100.000 SEK. We bought her in year 2003 for breeding of show jumpers/three-day event horses. High Spiritsxx has breeding classification B. We have had 6 foals of High Spiritsxx, they are all presented below. On the picture you can see High Spirits and her foal High Grace af Svenstorp. Swedish Warmblood. Gelding borne 1991. Swedish Warmblood. Mare borne 1999. We bought Xantippa in year 2005 for dressage competing and for breeding dressage horses. In Mars 2008 the first foal of Xantippa was borne, please see below the presentation of Oliver. Xantippa has breeding classification B.
Xantippa has very good paces and she is also a good jumper. The North Swedish. Gelding borne 1999. Musse is used for riding and driving. He is good to have when the ring has to be raked. Musse has been a film star in the movie of ARN. Musse is also very good as a teacher for our young stallions when they are separated from their mothers. Swedish Warmblood. Gelding borne 2003. Pajazzo is the first of our breeding. We will be using him for dressage competition. Pajazzo is a sensitive horse but he is very kind. Pajazzo has started one LA:3 with 65% and we will continue to train him further. Swedish Warmblood. Mare borne 2004. High Zurprise is High Spirits first foal. High Zurprise and Miss Quickly were borne at the same night. We where watching Sherry but when we went to the stable this night it was High Spirits who had started to deliver. Four hour's after the borne of High Zurprise Miss Quickly arrived. These two mares have grown up together. High Zurprise is a careful jumper with very good technique and a lot of energy. This is a half-sister of Pajazzo. 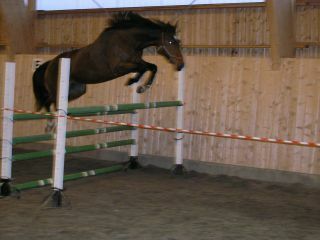 We think of Quickly as a jumping horse but she has also very good movements. We will educate her in both jumping and dressage. Quickly is a horse with a lot of temperament. The first foal of Miss Quickly's is presented below. Swedish Warmblood. Mare borne 2005. This is a half-sister to High Zurprise. Flisan, as we call her, is a little bit cooler than her half-sister but sometimes she give us a good hint that the energy is there to be used when needed. We have not been riding Flisan yet, but we are working with it. We think of Flisan as a jumping horse and we hope she will grow a little bit more as she is quite small. Hopefully she will be a good jumper in speed classes. Swedish Warmblood. Gelding borne 2007. Sandoz is a very noble horse. We think of him as a dressage horse but in the pasture he has showed that he is a talented jumper so the time will have to show what he will became. He is playing with Emsen and Oliver and sometimes it is rather ruff. Swedish Warmblood. Gelding borne 2006. (now 166 cm). He is quite sensitive but also very kind. He is planned to be a jumping or a three-day eventing horse but time will show what he will be suitable for. As seen on the photo he has a lot of scoope when jumping. Swedish Warmblood. Gelding borne 2008. Oliver was was borne a cold night in March 2008. He is a robust horse with a curious mind and he is very frank and social. He is the first foal of Xantippa and she was doing a great work as his mother. This horse is to be a dressage horse as he is breeded from very famous dressage horses (Hohenstein 95091, Lauries Crusadorxx, Donnerhall and Vivaldi 753). 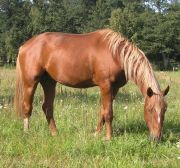 Swedish Warmblood. Mare borne 2009. This little filly was borne in March 18th. She was up on her feet before her mother and she is a very alert little horse, like quicksilver. She started on her first day to train canter around her mother in the box. This horse is breeded for jumping and with her temperament we think she's got what it takes. 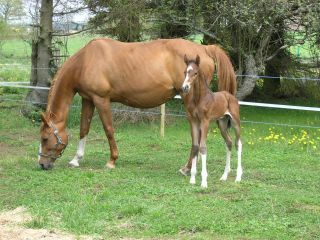 This little filly was borne in the middle of the day on 25th of April. She has very long legs and due to that she had to try a few times before she was up on her feet. Compared to Grace this little foal was shyer but as we are spending a lot of time with the mare and the new borne foal we knoe that this shyness will disappear. Swedish Warmblood. Stallion borne 2010. Swedish Warmblood. Mare borne 2010.